An apology, time for something new and a bit of the old. As I mentioned in my last email newsletter, I’ve been a bit lax on updates posts recently. A health scare, the death of a close friend and pressures from the day job have limited my time but also I ran into a logistical issue with my layout. The Great South Railway is my N scale model railway and as a large layout it was always going to be a long term construction. A problem I didn’t foresee when starting it however was that as a slow build project it limits what I can write about it with the frequency needed here for the Model Railway Engineer blog. To remedy this situation I’m breaking one of my golden rules and starting on another project. “Windon” will be a small mixed-gauge DCC model railway set in the 1980s. I’ve chosen the 80s after seeing the inspiring modelling of @NSE_Latchmere. As regular readers will know, I tend to focus on steam era but the stunning 80s era rolling stock on the Latchmere layout — the above for example — have left me wanting my own diminutive diesels and EMUs so my new layout will be an Era 8 layout. (This also has the benefit that modern rolling stock is more adaptable to EM gauge, which I’ll get to in a minute). Locationally, I’m also following Latchmere’s lead and not just to massage his even ego further. Wimbledon, where I grew up. Woking which is just up the line from Guildford where I live today. Setting my layout in an imaginary town loosely based on these locations, with Network SouthEast rolling stock, will give me easy access to plenty of prototype reference material. Wimbledon in particular is an area I know well and I’m looking forward to making some of childhood haunts in model form. I’ve already hinted at EM gauge and the primary line passenger service of my new layout will indeed be on EM gauge track. (EM uses OO scale trains but with wider rails/axels and more realistically spaced sleepers). 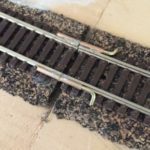 Improved track work is a key aim of this layout over my N gauge layout and using EM instead of stock Hornby-style OO gauge will allow this. It also means I can dabble with making my own track again and use fully equipped DCC locos – lighting and sound in particular. If you re-read the above you’ll might notice I referenced ‘primary line’ passenger service. This choice of words wasn’t by chance. The passenger services will run on EM gauge but additionally I’m also intending to have a secondary narrow gauge track. I’ve always wanted to have a narrow gauge layout so I’ve decided to incorporate one alongside the main line to carry goods between a small river dock and a goods yard. Looking forward to recreating part of Abbey Mlills on the River Wandle on my new layout. Those of you who know South West London and North Surrey today may wonder how I can justify an industrial narrow gauge railway and river in what is very much a suburban area. Luckily, there was a narrow gauge railway operating in the area* and the River Wandle flows through Merton so I do have credible excuse for both. (As a teenager I spent a lot of time playing around this river — especially Abbey Mills and its waterwheel — and I’m looking forward to capturing some of this in miniature). Being narrow gauge, normal OO gauge track won’t be suitable so I’ll be using 009 (N gauge) track for this part of the layout. This is narrower than 00 gauge but the locos and stock are to OO scale. The actual narrow gauge line I’m liberally borrowing was a 400 meter oval strip of track with a single diesel loco but adapting this into a shunting puzzle track plan for interest. I’ve previously mocked up a shunting puzzle track plan based on actual sidings at Guildford sidings which I’ll utilise for this. The concrete base beginning of the home for the new layout. Above, I’m inspecting the work so far, this is after the concrete has been poured. From these angles the shed looks smaller than it is but it’s big enough for the new layout. Many of you will know my main N scale railway lives in my loft. Sadly there isn’t space up there for another layout so after discussion with my wonderful, very understanding, wife its been agreed a shed will be built and the new layout will be constructed in this. Of course there are certain environmental challenges with building a railway in a shed (keeping it dry etc). I’ll be covering these in a future post but in the meantime phase 1 has begun, with the shed ordered and a reinforced concrete base laid. The shed should arrive in the next two weeks so wish me luck. In creating “Windon” from the ground up, literally in the case of the shed, I’ll be able to not only post more frequently here but also build up a complete right-from-the-beginning blow-by-blow guide to making a model railway. Being a step-by-step guide, every aspect will be covered starting with the construction of its home. Of course, Great South Railway will continue and there will still be lots of posts about it and techniques used in its construction during the months and years ahead. The latest post, on super-elevation, being a prime example of a technique I’m using on several of its curves. On the subject of the Great South, work continues. Two sections are now in place, continuing to focus on Cornwall. The first board is a yard and loading area with two inclines leading away. One to a trestle coal dump and another leading off through a tunnel to the next section where the Tin mine workings are to be found. * The narrow gauge railway is the North Surrey Joint Sewage Board railway that operated in Surbiton, close to Wimbledon, with a diesel locomotive and 20 wagons. Good luck on your new project. We are having to do one as due to bedroom tax lost our home of over 20 years which included a large OO gauge layout. (we also ran Modelpals the model rail club by post for over 13 years). Now working on a smaller OO gauge layout in this house but have not been in the mind set to start until now. Plan to do it on South Central were worked plus South East were lived so possibly around London Bridge. Keep us all posted on how you go. Good luck with it Andy. I look forward to seeing the layout come to life. Many thanks for the excellent tips and articles. As a newbie you have been a source of inspiration.